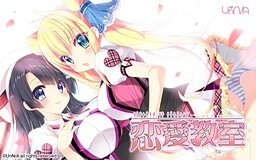 Ren’ai Kyoushitsu is the debut visual novel by UnN/A. It takes place in a school that was an all-girls school until just last year. So it’s no surprise that our protagonist is nervous when he enters the classroom for the first time. He is immediately treated as a rare animal. Whether this is a good thing or not is what you’ll have to judge for yourselves. Because there are 3 groups within his class. There’s the enthusiasts, the moderates, and the conservatives. Whereby the last group is strictly against the school opening to boys. How will you cope with this kind of situation? There’s plenty of girls around at least. But will they get to like you?